First, the Ms. Quasimodo of Bengal and Indian politics, Mamata Banerjee announces that it was a “bomb blast” with great bombast. 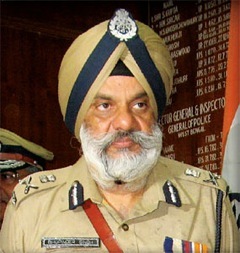 Then, Bhupinder Singh, the Police IG and KPS Gill-wannabee (who had earlier smeared and lied about Chatradhar Mahato’s insurance, property etc and never bothered to retract anything) says that two posters were found proving that the Maoist PCAPA had taken “responsibility ”for the train disaster. The two posters, it turned out, merely stated the intent of the local PCAPA the reasons for their on-going struggles. Ms. Bomberjee also claimed that a pilot vehicle had passed by just before. She did not state how “before” it was. One hour, two hours, five hours, one day? After the entire place is “infested” with Maoists. Is it not? Whom Will We Honor on Memorial Day? 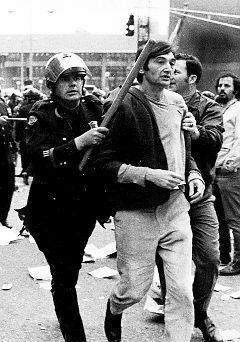 (Howard Zinn, noted historian and writer of A People’s History of the United States, was a military veteran who became a leading anti-war activist against the US wars in Vietnam, Iraq, and Afghanistan. He died January 27, 2010, at the age of 87. He wrote about Memorial Day in the following essay). It will also be celebrated by the display of flags, the sound of bugles and drums, by parades and speeches and unthinking applause. It will be celebrated by giant corporations, which make guns, bombs, fighter planes, aircraft carriers and an endless assortment of military junk and which await the $100 billion in contracts to be approved soon by Congress and the President. 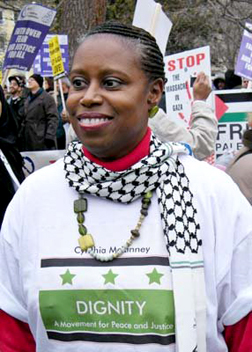 Cynthia McKinney Mourns the Dead of the Freedom Flotilla to Gaza: People of the U.S. and the world must end Israeli impunity now! I am outraged at Israel’s latest criminal act. I mourn with my fellow Free Gaza travelers, the lives that have been lost by Israel’s needless, senseless act against unarmed humanitarian activists. But I’m even more outraged that once again, Israel’s actions have been aided and abetted by a U.S. political class that has become corrupted beyond belief due to its reliance on Zionist finance and penetration by Zionist zealots for whom no U.S. weapons system is too much for the Israeli war machine, and the silence of the world’s onlookers whose hearts have grown cold with indifference. Who are the U.S. Participants in the International Aid Flotilla? A stormy rally is being held at the moment at the Israeli Consulate in Ankara where Turkish people gathered to protest against Israel’s attack on ships carrying aid to Gaza, local media reported. 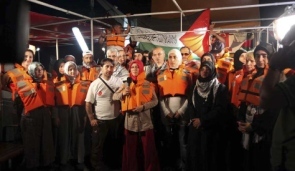 The six-ship convoy carrying aid for Palestinians and led by a Turkish vessel with at least 500 people on board set sail for Gaza from international waters off Cyprus on Sunday in defiance of an Israeli-led blockade of the territory. The flotilla was expected to arrive near Gaza at about 9 am Monday, according to officials. Israeli forces on Monday attacked the ships, killing up to 16 and wounding more than 60 others. It is reported that IDF’s forces are waiting for arrival of the captured foreign ships at Ashdod port. Israeli commandoes have stormed a flotilla of ships carrying activists and aid supplies to the blockaded Palestinian enclave of Gaza, killing as many as as 16 of those on board. A spokesman for the flotilla, Greta Berlin, said she had been told that ten people had been killed and dozens wounded, accusing Israeli troops of indiscriminately shooting at “unarmed civilians”. But an Israeli radio station said that between 14 and 16 were dead in a continuing operation. Let the railway authorities ply their trains on schedule. There is nothing to fear. On Saturday, on behalf of the State Committee of the CPI (Maoist), Aakash issued this statement to the press. “We were not involved in the sabotage in the railway line. Still we are being falsely implicated in it. There is no need to stop railway service on the plea of Maoist sabotage. Let the rail authorities ply their trains. Nothing (no harm) will be done from our side”.